One of the things I want to make sure my two kids understand is that there are lots of children who are not as fortunate as they are — especially this time of year when the words “I want” become part of their daily lexicon. That’s why we adopted a family through my daughter’s school and why I always ask them to help me go through their toys to pick the ones they no longer use to give to our next-door neighbor who works with local families in need. This year, however, giving to those less fortunate than us, has gotten even easier thanks to Walmart’s campaign known as Fill the Truck. 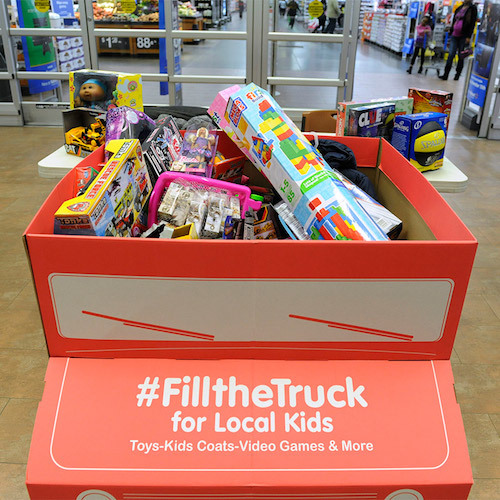 Working in conjunction with the Salvation Army, Walmart has put out cardboard boxes in the shape of trucks like the one you see in the photo above and all you have to do is purchase a toy or a coat for a child in need and drop it off in there. The Salvation Army will then be in charge of distributing the donated items to local kids in need. Some Walmart stores will also have a special event the next two weekends where volunteers will work together to fill the actual trucks with the donated toys. I think that the best part about this program is that it really can’t get any easier to donate. Think about it, all you have to do is buy one or two toys while you’re shopping at Walmart and then just drop them off in one of the cardboard boxes by the entrance. Toys should be appealing to engage the child over a period of time. Information and resources are provided in this report so pediatricians can give parents advice about selecting toys. Really enjoyed your article Let's Fill The Truck with Toys for Kids in NeedSpanglishBaby??? and look forward to returning for more.